Chicago police officers on Dec. 18 watch demonstrators protesting the fatal police shooting of Laquan McDonald in Chicago. CHICAGO — The severe spike in gun violence Chicago is experiencing can be dated to the release of the video in the Laquan McDonald case, a FiveThirtyEight analysis of crime data shows. The same analysis shows that the city has seen a significant drop in arrests made for homicides and nonfatal shootings, as well as other crimes, since the video’s release on Nov. 24. This suggests a decline in law enforcement activity that may be contributing to the rise in gun crime. McDonald, a black 17-year-old, was shot 16 times and killed by a white police officer in October 2014, but video of the incident was not made public until a judge ruled that it had to be released more than a year later. Intense protests, a U.S. Department of Justice investigation, and calls for the resignation of the police chief and mayor followed. Chicago police officers have said they are confused by public scrutiny in the wake of the video’s release and have pointed to new and burdensome paperwork as discouraging them from making street stops and engaging in other “proactive policing.” Department spokesman Anthony Guglielmi acknowledged that officers might have been more uncertain since the release of the video but suggested that the majority of the change was due to the paperwork requirements. Late last month, Chicago Mayor Rahm Emanuel appointed a new interim police chief, Eddie Johnson, in the hopes of improving department morale. Johnson faces the prospect of the bloodiest year since at least 2003: Chicago is on pace for roughly 570 homicides and nearly 2,100 nonfatal shooting incidents, numbers that could be even higher if the violence increases with warmer weather. After some cities saw a rise in crime last year, police chiefs and even the head of the FBI suggested that the United States was experiencing a “Ferguson effect”: Police officers sensitive to public scrutiny in the wake of protests over the 2014 police killing of Michael Brown in Ferguson, Missouri, were pulling back on police work, the theory went, and emboldened criminals were seizing their chance. The evidence for any such effect nationally was mixed — our colleague Carl Bialik analyzed crime data from 60 major cities in September and found an increase in homicides in some places, but a decrease in others. Chicago had seen a 20 percent increase in homicides from the year before, but, as Carl noted, crime statistics are volatile. The spike in gun violence in Chicago since the end of November, though, is too sharp to be explained by seasonal fluctuations or chance. There have been 175 homicides and approximately 675 nonfatal shooting incidents1 from Dec. 1 through March 31, according to our analysis of city data.2 The 69 percent drop in the nonfatal shooting arrest rate and the 48 percent drop in the homicide arrest rate since the video’s release also cannot be explained by temperature or bad luck. Even though crime statistics can see a good amount of variation from year to year and from month to month, this spike in gun violence is statistically significant, and the falling arrest numbers suggest real changes in the process of policing in Chicago since the video’s release. News coverage of the recent spike in violence has so far focused on the murder count since the beginning of the year. 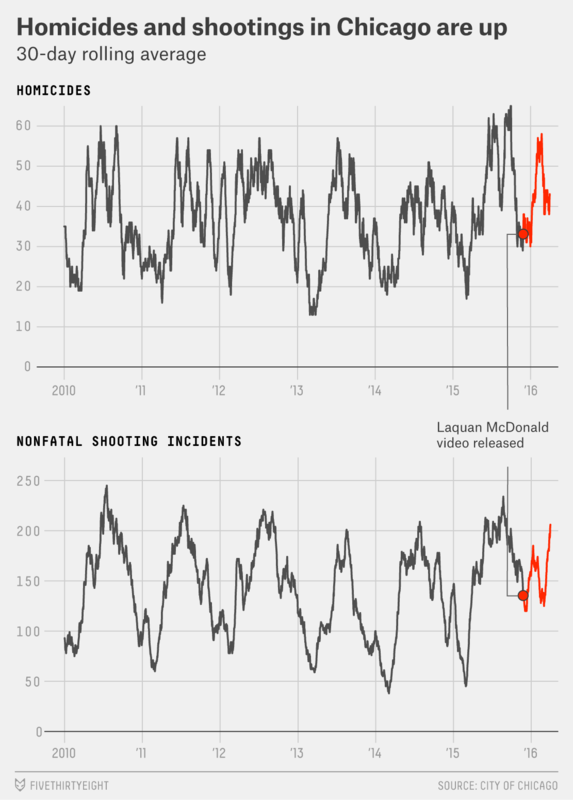 But using Chicago’s open data portal, we were able to pinpoint the start of the increase in gun violence — and the concomitant policing slump — to the wake of the release of the video showing McDonald’s slaying. The increase in gun violence starting in December is especially notable for a time of year when there are typically fewer homicides and nonfatal shootings. After a summer that saw a level of gun violence that was roughly in line with those over the last decade, Chicago has had its worst winter3 for gun violence since 2003. Nonfatal shooting incidents and homicides over this period were up about 73 percent and 48 percent, respectively, from the same period a year ago. Higher temperatures are associated with more violence for a variety of reasons. But although Chicago experienced an unusually warm winter,4 historical data suggests that this would move the rate of violence only slightly. For example, the winter of 2012 was even warmer than this year’s, but we observed no similar spike in gun violence then. And warmer weather would do nothing to explain the drop in arrest rates.5 Data from Chicago’s incident reports shows that arrests for all crimes fell moderately6 each of the last three winters compared with the previous winter, before plummeting 31 percent this season compared with last year. 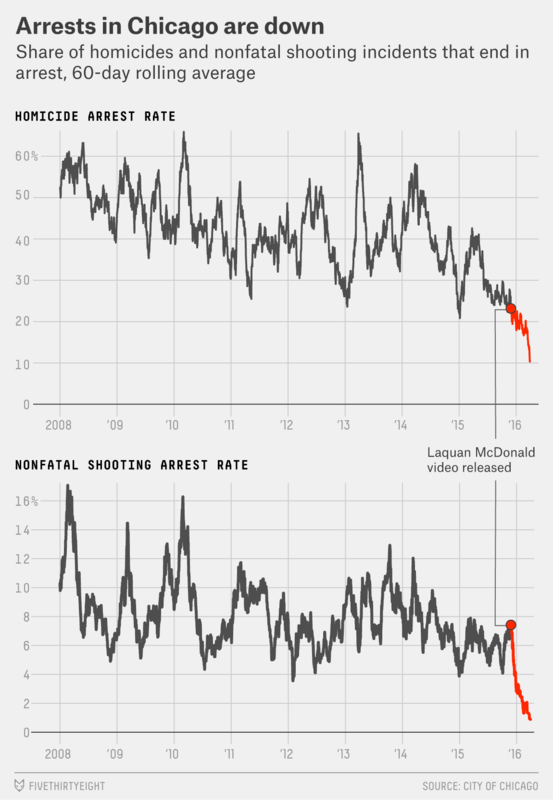 Arrest rates for nonfatal shooting incidents showed the biggest drop. Narcotics arrests were also down, a trend that began earlier in 2015 but accelerated at the beginning of December, about a week after the video’s release. The trend of rising crime and falling arrests has been most dramatic with respect to gun violence. We can see this by looking at how often arrests are made in homicide7 and nonfatal shooting incidents. Chicago police made a relatively steady number of arrests per homicide and nonfatal shooting incident each year from 2001 through 2014. But the ratio of arrests for each fell in the immediate aftermath of the video’s release and then plummeted even further in March. Only seven of more than 500 nonfatal shooting incidents (about 1.4 percent) and 24 of 143 homicides (16.7 percent) in the first three months of 2016 have led to an arrest.8 By comparison, an arrest was made in 16 of 166 nonfatal shooting incidents (9.6 percent) and 7 of 30 homicides (23.3 percent) in October, the month before the video’s release. The average murder clearance rate for large cities is 61 percent, according to the most recent FBI statistics. It’s possible that some of the recent decrease in the arrest rate for homicides and nonfatal shootings is because officers have had less time to investigate the most recent crimes and make arrests. Indeed, examination of older data shows that the arrest rate is depressed in the period closest to the most recent available records. 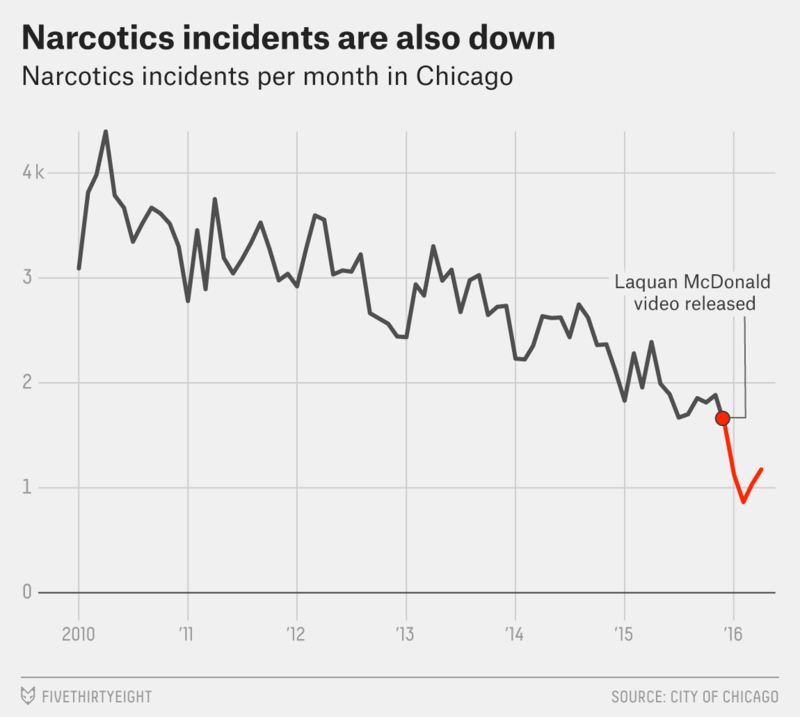 But in Chicago we have still seen a dramatic drop in the arrest rate before the most recent month of data, and it’s implausible that this effect explains the full decline since December. In fact, the change in arrests for gun violence began at least four months ago, around the time the video was released, and arrest rates have continued dropping to a level unseen since at least 2001, the earliest year of available data. A similar decline in police activity and increase in violence occurred in Baltimore after protests over the death of Freddie Gray, who died in police custody. Likewise, police activity in New York City slowed down dramatically after police killed Eric Garner. In the case of the New York Police Department, some news outlets suggested that the slowdown was a large-scale, organized protest against interference by the mayor. Jamie Kalven, a journalist whose reporting brought attention to the McDonald case and who knows several Chicago police officers, is skeptical that there is any mass protest among police, even if some individual officers may be deliberately slowing down. Instead, Kalven thinks Chicago police are bewildered by a more hostile public. He pointed to a slogan that has become increasingly popular among police, shared on police blogs and even sold on T-shirts: “Stay Fetal,” a reference to comments from the mayor, who said officers had gone “fetal” to avoid trouble. There is “a genuine lack of clarity about the job description, the parameters of the job, and who will have their back in ambiguous situations,” Kalven said. Roseanna Ander, an executive director at the University of Chicago Crime Lab, agrees that the police are uncomfortable. One likely consequence, she said, is a drop in the kind of “proactive” policing that is meant to prevent crime, including street stops, as officers seek to cut down on their discretionary interactions with civilians. “Certainly they’ll respond to 911 calls … but if you have a group of guys on the corner and you think you have probable cause to stop them and see if one of them has a gun, you’re probably not going to do that,” Ander said. Ander stressed that proactive policing comes with significant social costs and only rarely leads to arrests in shooting incidents. But data on arrests for crimes that often fall within the category of proactive policing, in particular narcotics arrests, support the notion of a decline in police activity. Narcotics incidents (essentially synonymous with narcotics arrests9) dropped by 29.6 percent in December from November, by far the largest one-month drop since 2001. The data on narcotics incidents seems to support this assertion. Narcotics incidents fell another 22.9 percent from December to January before rebounding slightly in February and March, though they are still occurring at about half of the 2015 level. Guglielmi placed much of the blame for the decline in proactive policing on a new form that must be filled out after some interactions with members of the public, a result of the city’s August 2015 settlement with the American Civil Liberties Union over the department’s “stop and frisk” program. 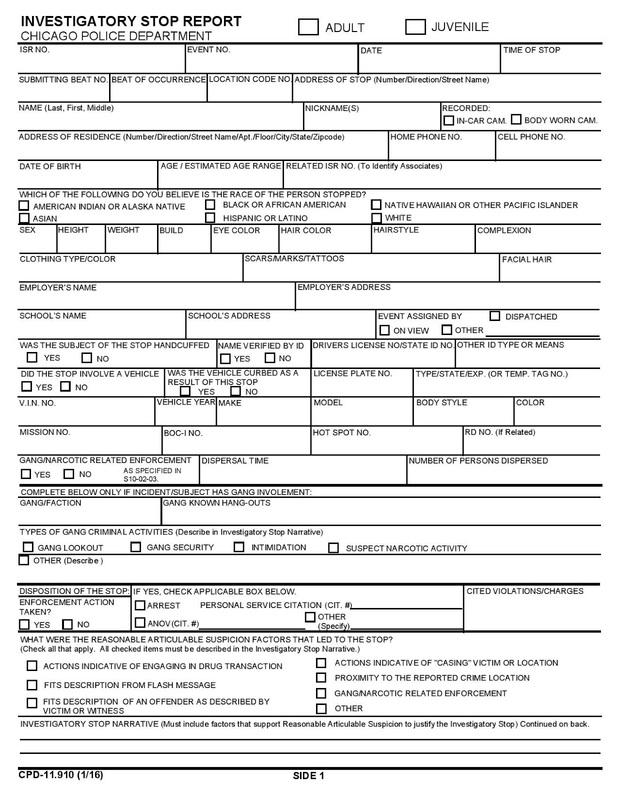 The form, called an investigatory stop report, is much longer than the contact cards it replaces and can take hours to complete after some encounters. Officers told the Chicago Sun-Times in January that an “ACLU effect” was driving a reduction in police activity. “The rules of the game changed on Jan. 1,” Guglielmi said. Although the ISR may be playing a minor role in curbing proactive policing, it doesn’t appear to be the major reason behind the downward trend in arrests. The ISR was implemented on Jan. 1, 38 days after the release of the Laquan McDonald video. In that five-week span, the overall arrest rate fell from 26 percent to 19 percent. Since Jan. 1, the overall arrest rate has risen slightly. The onset of the decline in arrests significantly predates the ISR, and arrests have actually increased since it was introduced, though they are occurring less frequently than they did in 2015. Ander noted that several less controversial crime prevention and intervention resources in Chicago have had their funding cut recently because of a state budget crisis in Illinois, perhaps contributing to violence in the most troubled neighborhoods. Whatever combination of factors explains the opposing trends in gun violence and arrests, it’s not clear how to contain Chicago’s crime wave. With higher summer temperatures approaching, the gun violence may get worse before it gets better. Chicago provides victim data on homicides and incident data on all other crimes, so a nonfatal shooting can have multiple victims but be counted as one incident. The public city data we used does not differentiate nonfatal shootings from other types of batteries, so we’ve used aggravated battery with a handgun or firearm to approximate nonfatal shooting incidents. This provides a daily count of nonfatal shooting incidents that tracks very closely with the periodically reported official numbers. Here defined as Dec. 1 through February. According to the National Weather Service, the temperature from Dec. 1 to Feb. 29 in Chicago averaged almost 5 degrees Fahrenheit above normal. Throughout this article, we refer to “arrest rate,” which measures what the Chicago Police Department calls “clearance rate” in its data. Clearance of a given case occurs when at least one person is arrested for a crime or the crime is considered cleared by exceptional means. This occurs in cases where a perpetrator is identified and located but cannot be taken into custody because of circumstances outside of the agency’s control, for example if the perpetrator has died or is facing charges in another jurisdiction that will not extradite him. Between 4 percent and 16 percent. About 85 percent of Chicago homicides since 2012 were carried out using a firearm, according to a Chicago gun-violence tracking website. These arrest rates were calculated using data available through April 9. Roughly 99 percent of narcotics incidents in Chicago involve an arrest, according to the city’s data.